Some people bring mementos from places they visit. Living out of travel bags, I can’t afford this luxury. Thus, I collect facts. Here is the good one. The Akashi Kaikyo Bridge is the longest suspension bridge in the world. I love bridges. The ancient ones for their weathered wizened appearance that invites you to the journey through time. The modern ones for their cutting-edge beauty that puts you in awe of the genius engineering and the technological possibilities of the future. 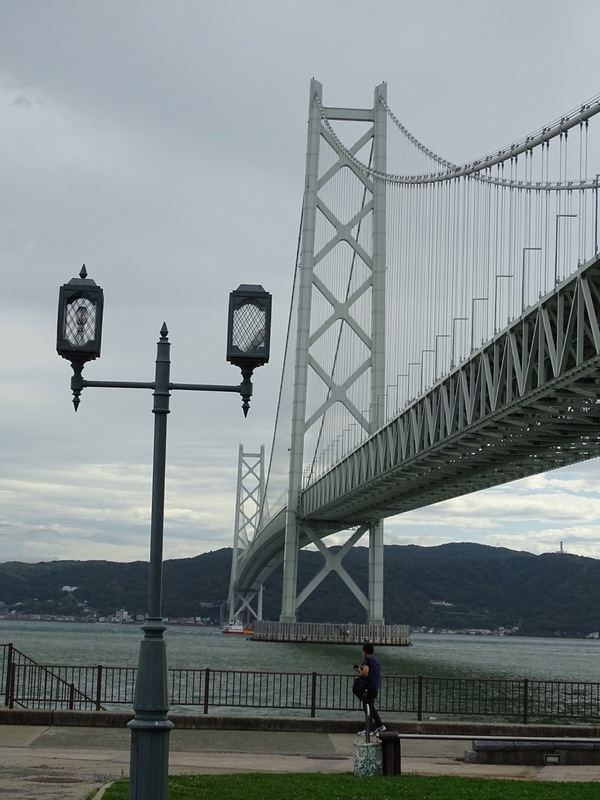 First time I heard about the Akashi Kaikyo Bridge was from the universal source of information called YouTube. A random video popped up showing top bridges around the world. The word “Japan” caught my attention. The aerial footage was beautiful. The best part – the location was just a couple hours away from my temporary home. There is a plethora of recommendations of things to do in Japan. Irritatingly, they all look like clones. The difference between those lists is the number of entries. “Top 20…” vs. “15 BEST…” vs. “The 50 …”. I even saw astonishing “234 Cool and Unusual…” Ride a shinkansen, eat ramen, try pachinko, see kabuki, wear kimono… If you went through one list, you read them all. Sadly, bridges are not too popular and rarely get included there. Let’s change it! 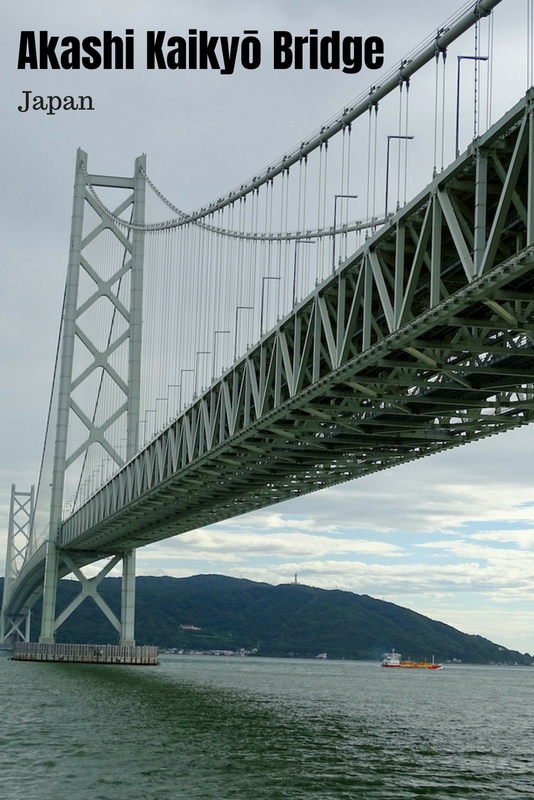 The Akashi Kaikyo Bridge, also known as the Pearl Bridge, is totally worth a visit. It is not only a marvel of modern technology but an astonishingly beautiful landmark. The central span was initially only 1,990 meters. The Kobe earthquake of 1995 moved the two towers so that it had to be increased by 1 meter. 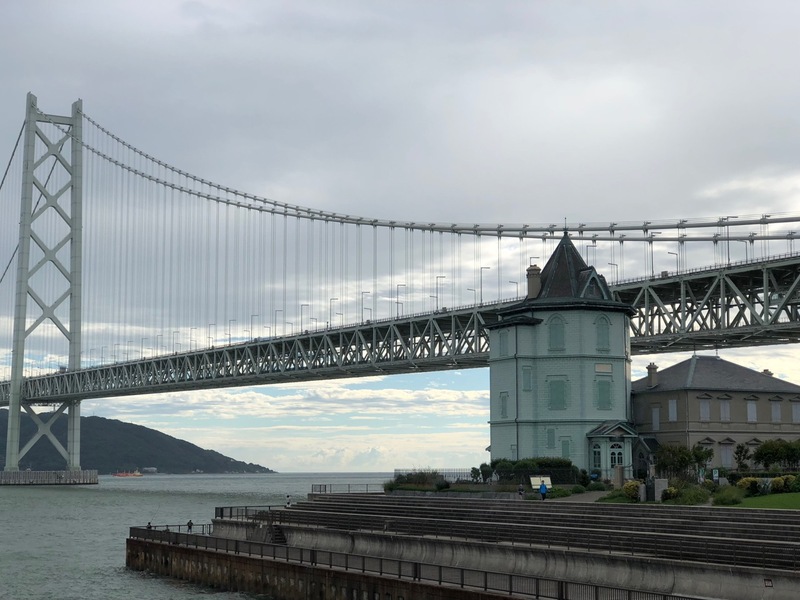 The Akashi Kaikyo Bridge, the longest suspension bridge in the world, has the record main span of 1,991 meters with the total length of four kilometers. It is 692 meters longer than the longest suspension bridge in the United States, the Verrazano-Narrows Bridge in New York, built in 1964; and 710 meters longer than the Golden Gate Bridge in San Francisco, constructed in 1937. 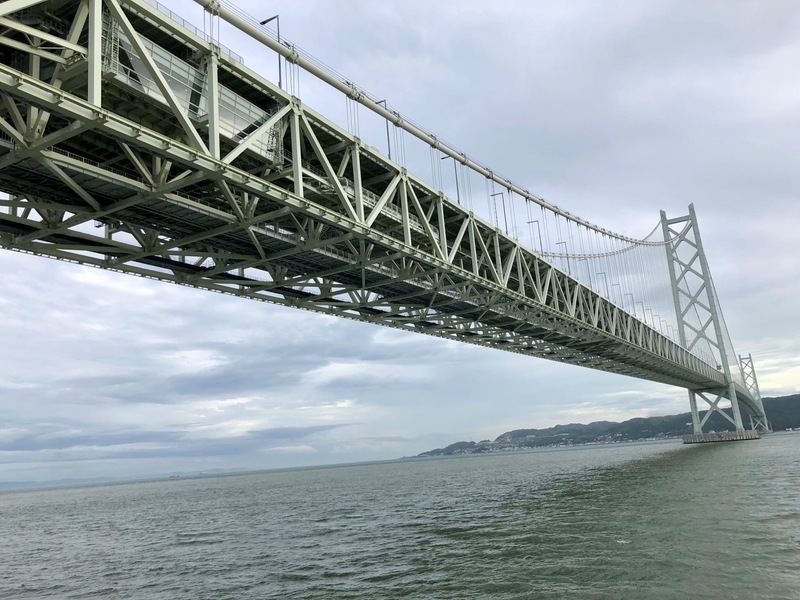 The Akashi Kaikyo Bridge crosses the Akashi Strait (in English, kaikyo means strait), connecting Kobe on the mainland with Awaji Island, the sixth largest island in Japan. The construction lasted 10 years from May 1988 till April 1998. The bridge was built in 110-meter-deep water with tidal currents of 4.5 meters per second. It was designed to withstand 80 m/sec winds and a potential 8.5 Richter magnitude earthquake. Several unique technologies were developed to support the design, construction, and maintenance of the Akashi Kaikyo suspension bridge. Among them, the world’s largest wind-tunnel was built to test the aerodynamic stability of the bridge. Another innovation, the dry air injection system, protects the main cables from corrosion. It injects dry air into main cables to keep the humidity inside the cables constant. The bridge was designed to last for more than 200 years. 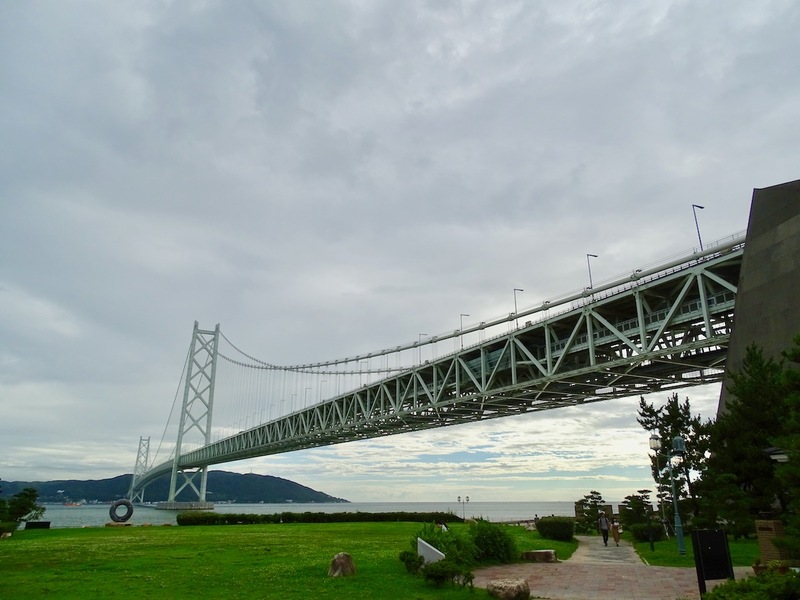 The Akashi Kaikyo Bridge and its surroundings is an excellent day-long trip from Osaka or Kyoto. With close proximity to Kobe, it could be tempting to combine the bridge experience with the city visit. Frankly, I wouldn’t recommend it. 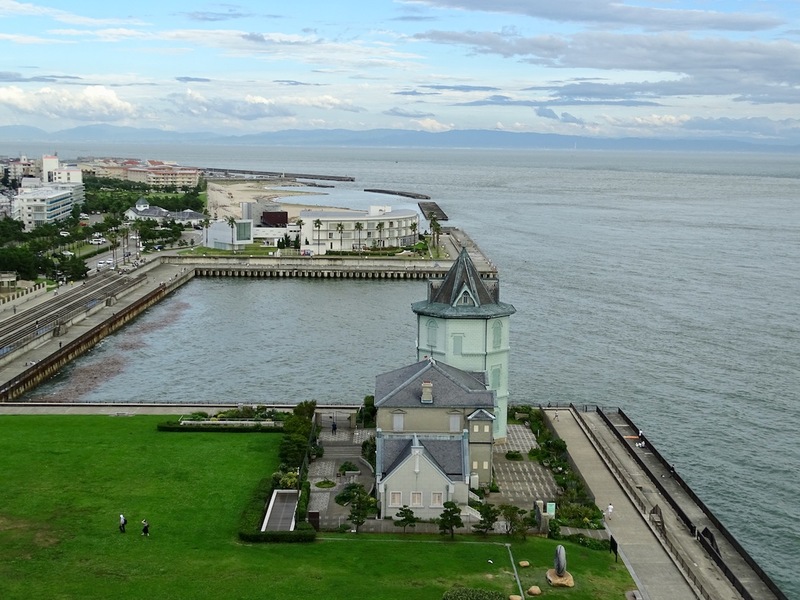 If your travel schedule permits, relax, walk through the park along the water, and enjoy Maiko Marine Promenade. Kobe deserves a separate visit to appreciate a Japanese city life not refracted through the prism of the tourism industry. Who would want to walk on an empty stomach, right? Especially, near Kobe famous for its marvelous beef. 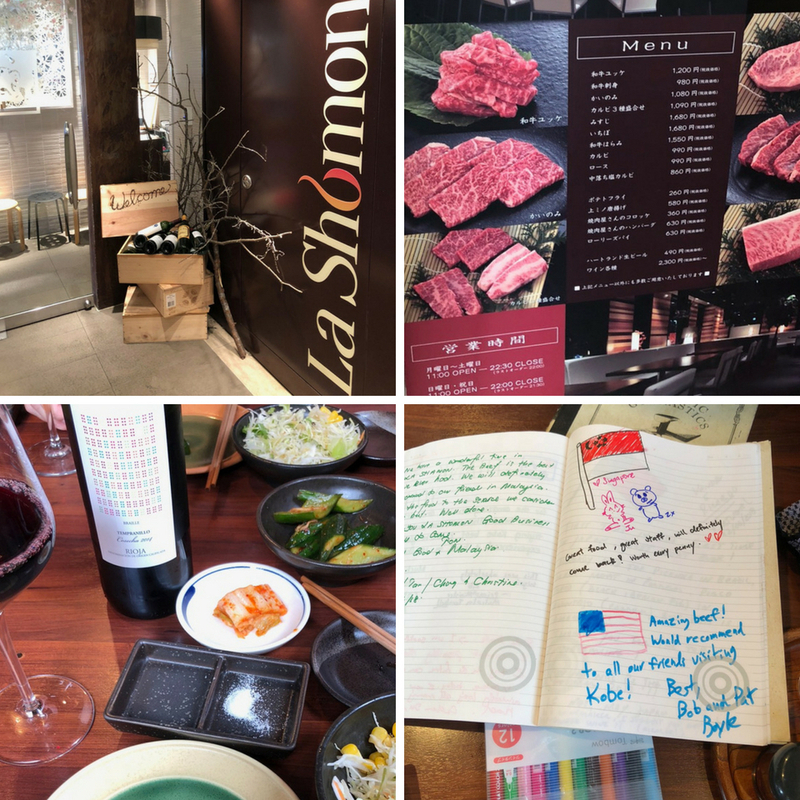 Hence, get off the train on Sanyo-Tarumi station and have lunch at La Shomon. Meet a Japanese sibling of a hipster eatery from the Greenwich Village. The ambiance is the same. The staff speaks English, and the menu is available in English as well. What to order is no brainer. Of course, it has to be Wagyu. Paired with excellent wine from their extensive selection, it would satisfy even the most demanding gourmand. In an unlikely case of still feeling hungry, you can taste their specially certified meat sashimi, and, of course, their outstanding dry-aged beef. La Sholom has a cute tradition of asking to leave a comment in their dogeared journal full of colorful scribblings from previous patrons. Some of the entries are quite creative, so prepare to unleash your inner artistic skills to match. After lunch, walk toward water and turn right. You end up on Tarumi seaside trail. Stifling heat of Japanese summer gives way to the refreshing sea breeze. On the way to the bridge, you would pass the Mitsui Outlet Park. Styled after a Southern European seaport town, it has an impressive selection of stores from world’s luxury brands to Japanese souvenirs. Do not spend all the time there – remember, there is still the bridge ahead. 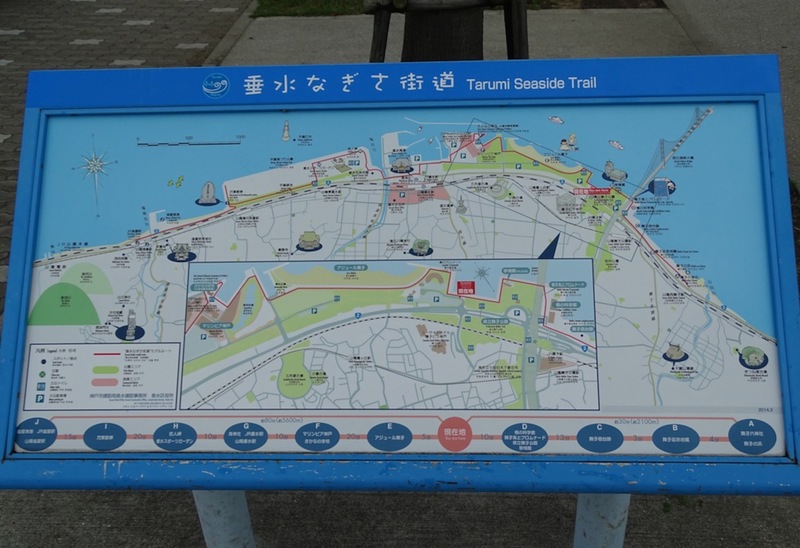 The Tarumi seaside trail is a popular place. 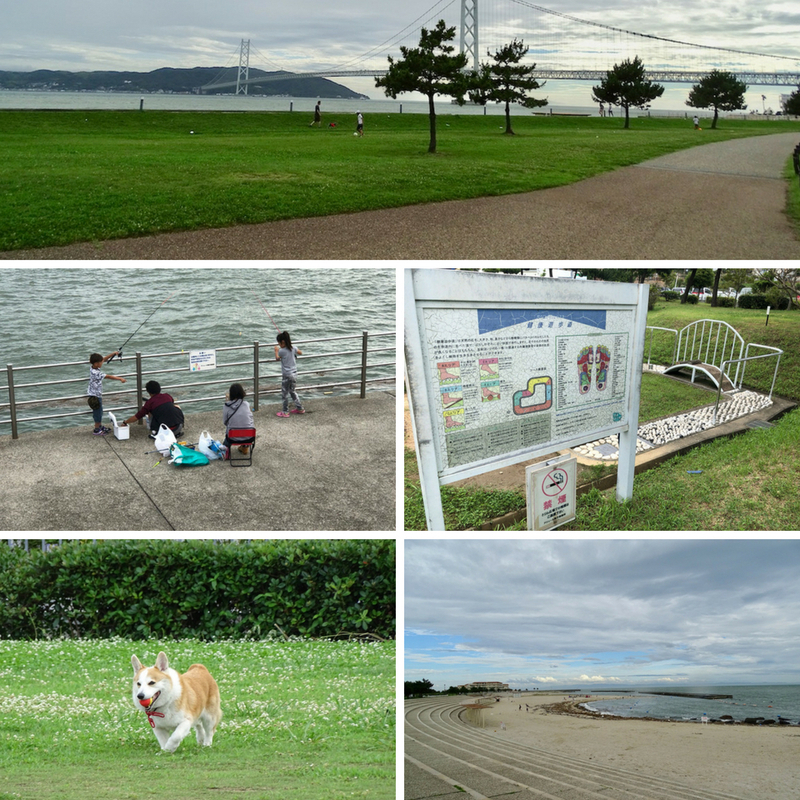 On weekends, kids and dogs happily play there, and adults exercise or walk along the water. Fishing is a family affair. Closer to the bridge, the Maiko beach is famous for its peaceful seashore. The namesake park has a few historical landmarks: the Sun Yat-sen Memorial Hall, the former Kinoshita-ke House, a Japanese style building constructed before the World War Ⅱ, and the former Mutou-sanji-tei House, a western style villa circa the Meiji Period (1868-1912). 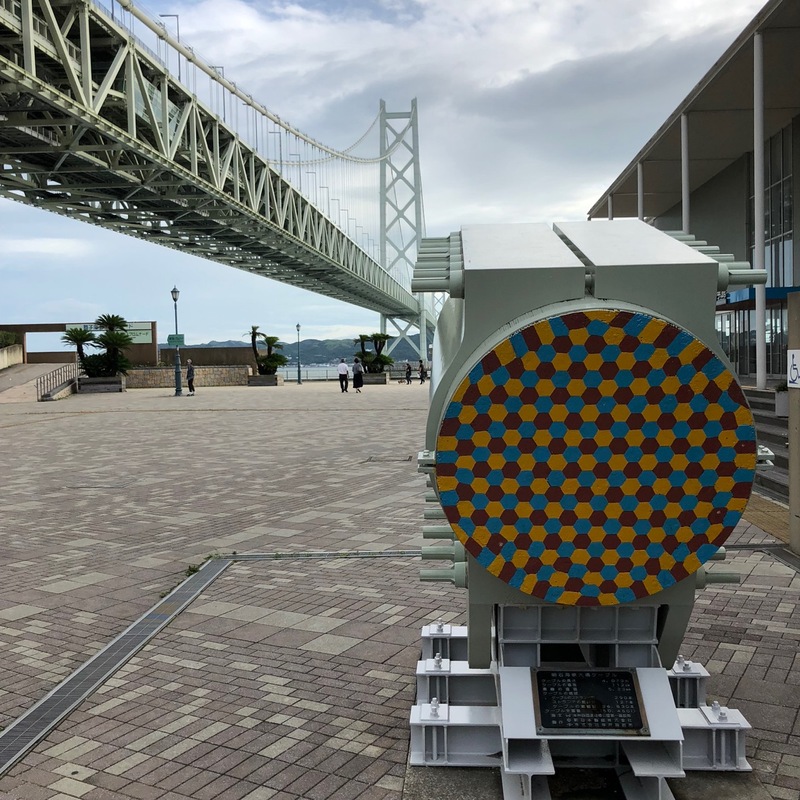 The Maiko Marine Promenade consists of observation corridors under the bridge’s surface about 50 meters above the water. 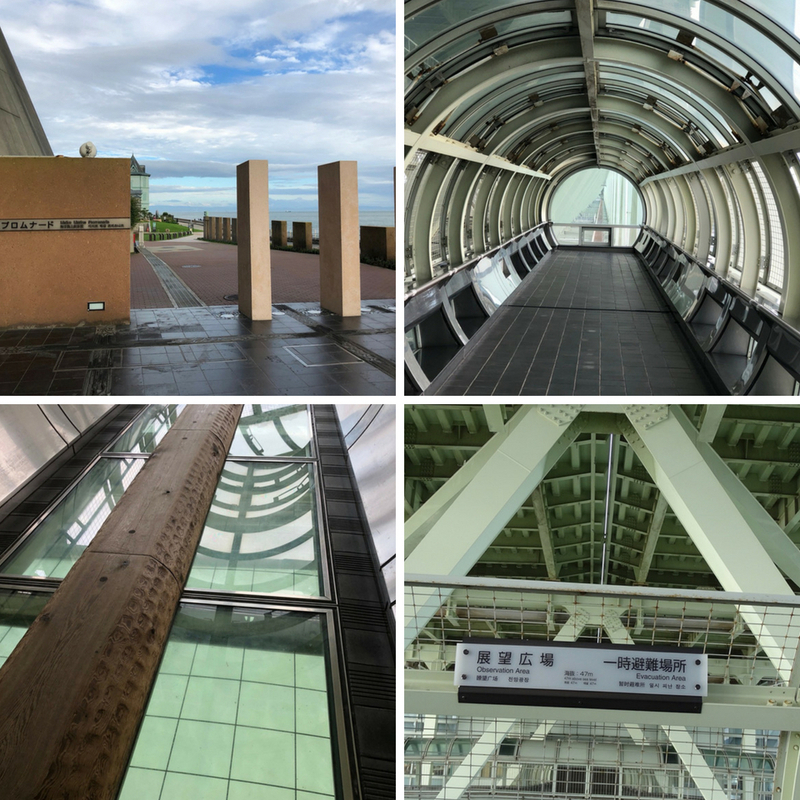 Accessed by elevator from the base of the bridge on Kobe side, the hallways offer fascinating views of the bridge’s interior, the Akashi Strait, and Osaka Bay. The official Maiko Park website has information about admission fees, access and facilities. … and, of course, read about us and how our nomadic slow travel journey had started and, eventually, brought us to the Land of the Rising Sun. 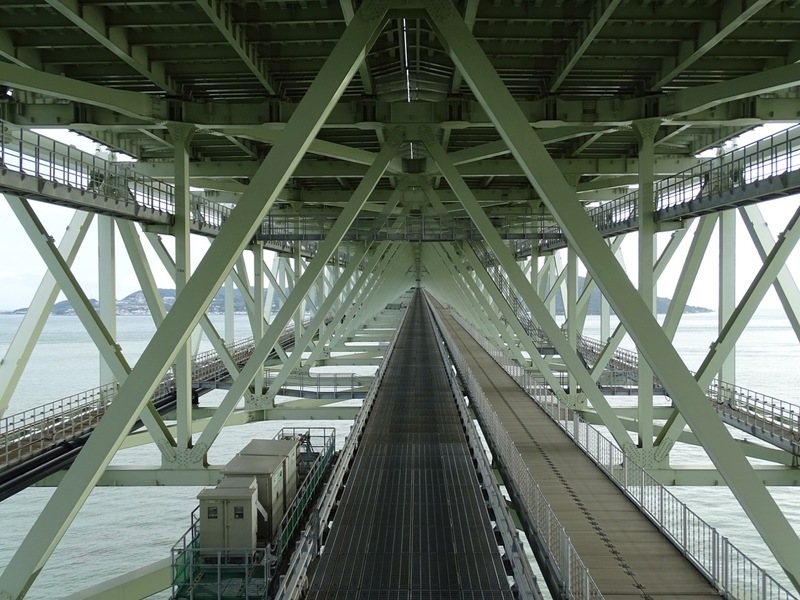 Here’s a piece I wrote about Akashi Kaikyo – the bridge tour really is something special. The views from the top (300m up!) are incredible. This is really cool. I’ve seen tons of documentaries on the Akashi-Kaikyo Bridge on the History Channel, etc but haven’t read a first hand account of actually visiting it. I’m a geek for these types of travel experiences and so glad to read you post. Might have to incorporate my own visit the next time we go to Japan. Hi Eric – if you do manage to get here, then I thoroughly recommend the bridge tour – provided you have a head for heights! Subscribe to Traveling Bytes updates.